HKUST IEMS co-sponsored the Conference on Globalization of Knowledge Creation and Innovation in the Context of Emerging Economies. 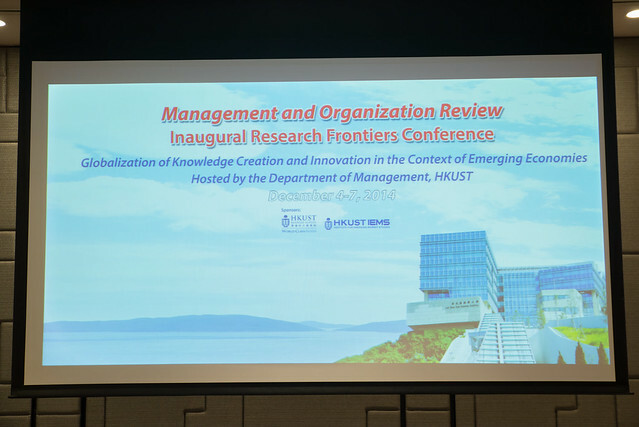 This inaugural Management and Organization Review (MOR) Research Frontiers Conference takes place at the Hong Kong University of Science and Technology (HKUST), from December 4 to 7, 2014; and the pre-conference Paper Development Workshop will also be held at City University of Hong Kong on December 4, 2014. The purpose of the annual MOR Research Frontiers Conference is to serve as the exploration platform of the journal to stimulate investigation and knowledge creation of phenomena in the social sciences underlying management and organizations and globalization through boundary-crossing dialog and discourse.The conference is intended to provide the Editors of MOR the basis for framing future special issues of this journal. In addition, the conference draws together social science thought leaders, management and organization scholars, executives, entrepreneurs, policy-makers, and non-business scholars in a community building and enhancing setting. For more information, please visit the conference web page.